We love it when our customers reach out and provide a challenge! Special thanks to Lori, a dear customer who requires gluten free, gum free, vegan delights. 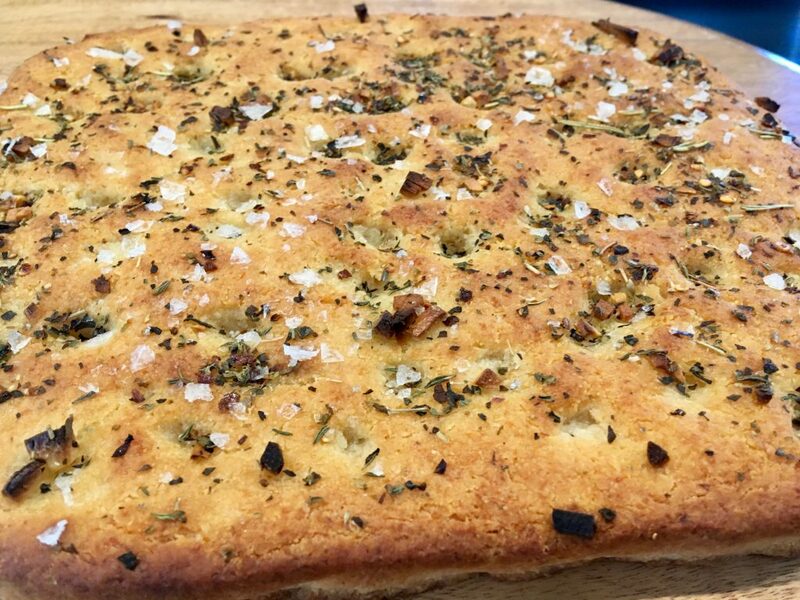 She asked us to adapt a focaccia recipe for her and I went to work right away. 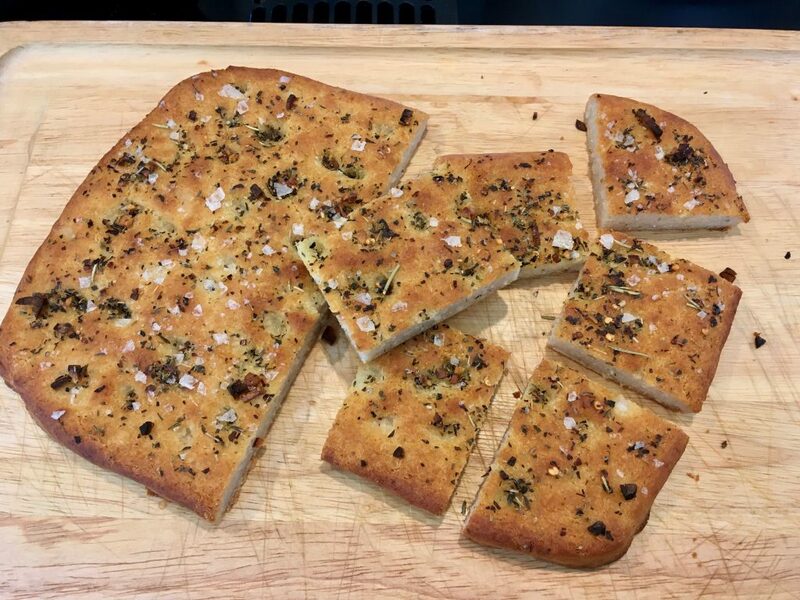 The resulting focaccia recipe tastes fabulous, and we are excited to share it with you! Our gluten free flour blend, Flour Farm, works with most dietary needs. All it takes is a bit of patience and a willingness to step outside of traditional baking boundaries. 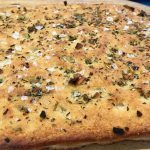 Our favorite part of this recipe is the Garlic and Herb Oil that bathes the surface of the bread, resulting in a taste-bud party fantastic. Wow, this oil blend is powerfully good. The original recipe came from Sarah Bakes Gluten Free. We think you are going to love it! Recipe for Garlic & Herb Oil: In a small bowl, mix together the following ingredients: 2 T Extra Virgin Olive Oil, 2-3 Cloves Minced Garlic, 1 tsp Italian Seasoning, 1/2 tsp Dried Basil, 1/4 tsp Crushed Red Pepper Flakes. Make a few days ahead of time, and store in the refrigerator. The flavors in the oil marry so well together, you may want to make a double batch and pour it over GF pasta! Remove from the refrigerator an hour before baking. Please leave a comment in the section provided below the recipe. We love to hear from you and to receive photos of your creations. 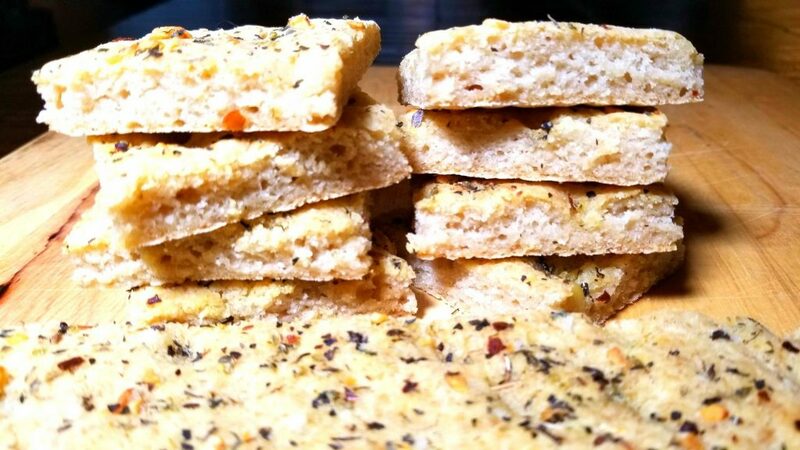 An important note: this recipe successfully uses Flour Farm Organic Gluten Free Flour Blend. This blend is found online at Amazon.com, Azure Standard or in a few local grocery stores. If you choose to make this with another flour blend, please note that your results may differ. Step 1: In a large bowl, whisk together the dry ingredients. Step 2: In a medium bowl or liquid measuring cup, whisk together the wet ingredients. Step 3: Slowly pour the wet ingredients into the dry while stirring with a sturdy spoon. Step 4: Allow the mix to sit for up to 10 minutes. Spoon the dough onto the parchment lined baking sheet. Use wet fingers to gently shape the dough into the desired shape and thickness. 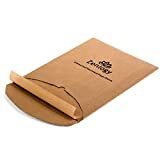 We prefer a rectangle shape that is about 1 inch thick. Step 5: Pour or use a pastry brush to spread the oil and herb mix over the dough. Use the tips of your fingers to evenly poke indents along the surface of the dough – about 1 inch (2.5 cm) apart. Sprinkle the sea salt flakes over the top. Step 6: Slide the dough onto the preheated baking sheet in the center of the oven. Bake for 10 minutes, then remove the parchment from under the bread. Bake for another 8-10 minutes. When fully baked, the surface will appear golden brown and a toothpick inserted in the center will come out clean. Remove from the oven using a peel or another rimless baking sheet. Step 7: Transfer bread to a cooling rack. Allow to cool for at least 10 minutes before cutting. 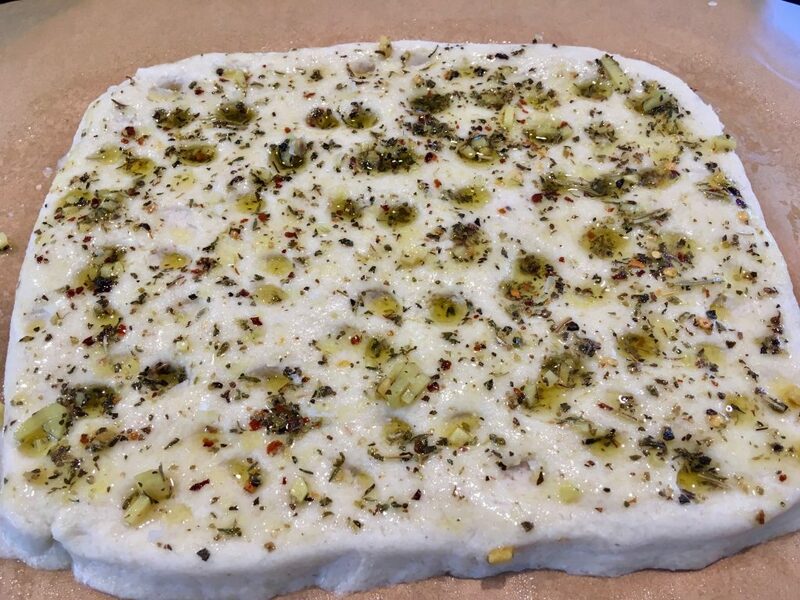 Focaccia bread stores in an airtight container on the counter for up to two days, and in the freezer for a month. Recipe for Garlic & Herb Oil: In a small bowl, mix together the following ingredients: 2 T Extra Virgin Olive Oil, 2-3 Cloves Minced Garlic, 1 tsp Italian Seasoning, 1/2 tsp Dried Basil, 1/4 tsp Crushed Red Pepper Flakes. Make a few days ahead of time, and store in the refrigerator. Remove from the refrigerator an hour before cooking. The nutrition information provided below is for the recipe as written using GF rapid rise yeast, and organic cane sugar. We omitted the pink salt and used Maldon Sea Salt Flakes on the top instead. Each slice weighs about 48g (1.7 oz).